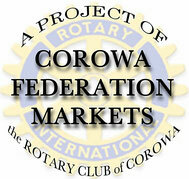 Below is a link, for current and prospective stallholders, to the "Rotary Market Stallholder Terms" form that needs to be completed in order to become a stallholder at the Corowa Rotary Federation Market. For those stallholders selling food a Notify Food Form, which is a requirement of the NSW Government also needs to be completed, this takes less than 5 minutes if done online. A link to the form is provided below. The "Online Info Form" is optional, but if completed will allow us to list your stall in the "Our Stallholders" tab of the website and if you wish we will also create links to your email address and website. This will provide stallholders with some extra promotion at no additional cost.